While the girls had Home Ec, the boys had Wood Shop, Metal, Shop, or Auto Shop. There are 16 comments for this item. Thanks for the compliment. The older of my 2 daughters is a talented artist; this is something that has appeared in both my children, and my sisters. It seems to be in the female side of the gene pool, though her younger son is quite talented, also. He went to the North Carolina School of Performing arts, and makes his living as a set designer. Even with a degree, he has had to fight his way to the middle of a very competitive field. My daughter, who is completely self taught, can make some nice money doing commission work on line, enough to supplement her job as a clerk at Wal-Mart. Though my parents didn't want me to become a musician, I have continued to play the instrument that has the most versatility for me; like my daughter, I taught myself something that I was interested in, and learned to play the bass guitar with some degree of ability, and have enjoyed the artistic outlet it occassionally allows me. I've always told both my children that it is fine to have a dream, as long as you have a way to support yourself, and anyone that may depend upon you, or, have a plan B to support plan A. Excellent story, Scott. America, it seems is bleeding folks with technical skills...older workers with these skills are retiring and/or dying and there are few replacements. All the talk about repairing an aging infrastructure is of no use without skilled workers who know HOW to the job...and are WILLING TO WORK to get it done!!! It's funny how some of us kinda 'stumble' into a profession we never expected to wind up in and actually love it...As I've said in previous posts, I wish I'd followed your path insteadda getting two (esentially useless - for my purposes) degrees. I had band in High School and the schedule for the day prohibited any vocational trainging if you had that, and put you in a fine arts program. My Dad was a heavy equipment mechanic, and didn't want me following in his foot steps, but didn't want me to be a musician, either. I had an apptitude for electrical work, so when I enlisted in the navy at 17, I became and Aviation electricians Mate. When my 4 years was up, I landed a job at the local Lear-Siegler plant, initially assembling gyroscopes for helicopters, and then took an upgrade to inspection. That lasted 18 monts, and then the 1980's arrived, and many of us struggled to find work for some years. I finally went to the local ITT institute in 1985, graduated with a decent 3.4, went to work in the maintenance dept. of a high end furniture factory maintaining CNC equipment. They moved out of state starting in 1994. During my time there, I received my Journeyman electrical license. I found an add looking for an electrician at the convention center in town, and became employee # 10 in town for SMG, a company that manages convention centers and sports areana's. I have been with them for a little over 21 years, and, no, I do not have a college degree, though, the classes before mine at the ITT school had their records transferred to a state that did not require humanities classes for a degree in applied science. At some point, the State of Michigan told them that wasn't kosher, so from then until they became accredited, all they gave was diplomas. I have not missed a paycheck since my first with this company in November of '94. I was not alowed to take any industrial Arts (shop) classes because I was in the College track well Sr year I had a free elective so I took Electronics because it involved physics (so my guidance counselor said) the ironic thing I wanted to be a shop teacher! I taught Industrial arts for 35 years. @ IOfferMyBentNickel - What a difference 10 yrs make...in 1967 (I graduated in 68) No guy would even think of signing up for Home Economics and if one did... they (the school) would cross it off and and tell him to pick something else. The same held true for girls. None would think of signing up for shop or automotive and if one did they too would be told to pick something it. The amazing thing is the NO ONE whined and cried and wanted to sue for discrimination. It was what it was and you lived with it. 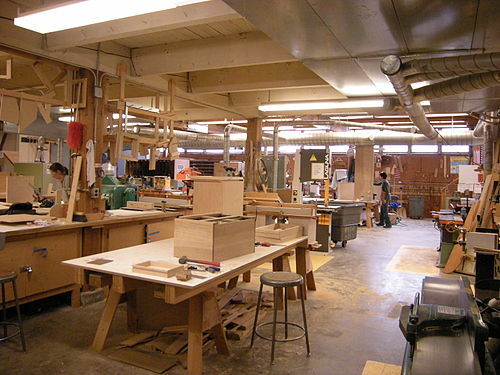 Now the photo of a wood & metal shop work area brings back some high school memories. I recall the entrance to the Home Economics Class (as my high school called it) was right next door to the Industrial Arts Class. I remember shooting a quick glance as I was walking into the Industrial Arts and noticing a couple of guys with aprons on. The year was 1977. I squeaked by with a D or C average (so I earned my h.s. credit) but, looking back, I wish I had signed up for Home Ec. instead of Industrial Arts. Memories. When I went to High School they had Bachelor Living, which was Home Mec for guys. My partner and I were to make a Pineapple Upside Down Cake. I was doing the mixing of ingredients and the teacher called me over. My partner said he would finish mixing the ingredients. Got back and the cake was in the oven. Well when it was time to take the cake out we could see it did not rise. He had forgot to put in the baking soda or powder, can't remember which one it was, but anyway we have to eat what it is we made. Need less to say, the cake was a little chewy. I think we got a D. for that mess. But thanks to You Tube I do pretty good now. @chriscroz - You got that right! I have friends with their 2 yr AAS degree (Associate of Applied Science) degree that were steadily employed and making darn good money (Retired now) than their counter-parts with 4 year college degrees. And they were not saddled with huge school loan depts because tuition fees were A LOT lower. A friend of mine, within a few years of graduating with a AAS in electronics was making about $60,000/year. May not sound like a lot but that was in 1985. That is equall to almost $140,000 today. Good one 'fargone' LOL I had a shop teacher missing 2 on one hand and one on the other. The standard joke was that Wood Shop was always taught by a teacher who was missing some fingers!! In our high school the girls had to take at least one shop class.